Barker's BrunchProviding RAW dog Food Diet . Healthy all the way to their souls ! Providing RAW dog Food Diet . Healthy all the way to their souls ! Please note : deliveries are ONLY every 1st & 3rd Sunday of the month for the Ottawa and surrounding area. If you are unsure as to what dates we will be delivering please email or call us. Pick ups available as per store hours listed above. Providing “RAW” dog food diet to the Ottawa and surrounding areas including the St-Lawrence Seaway ! As breeders we have encountered dogs with issues such as, dry skin, ear infections, food allergies, digestive issues, picky eaters and the list goes on. We have also had to overcome other obstacles in our business like dog odor and hair in the house and the disposal of large amounts of poop. After encountering these issues, we set out to find solutions to these obstacles. Consulting with several vets, nutrition specialists, the internet and our fellow dog people we found ourselves trying different commercial foods and vitamin supplements. After self educating ourselves through books, internet and animal experts we decided RAW was the way to go. Though, being a kennel with several dogs we found that we could not afford commercial RAW dog foods. Our second problem was getting a constant supply of the products we required. We have developed a network of suppliers and invested in stock to provided people with an affordable reliable source for RAW food. WATCH FOR NEW PRODUCTS AS WE GROW! We are not veterinarians or specialist ! We are breeders who have encountered issues with dogs health and found that a RAW dog food diet is the way to keep OUR dogs happy and healthy ! The topics we discussed and the information given is strictly our findings, results or recommendations. Please see our information links to educate yourself on RAW dog food diets. There are many controversies , beliefs, theories and proven results out there to help you decide if RAW is best for your dog ! 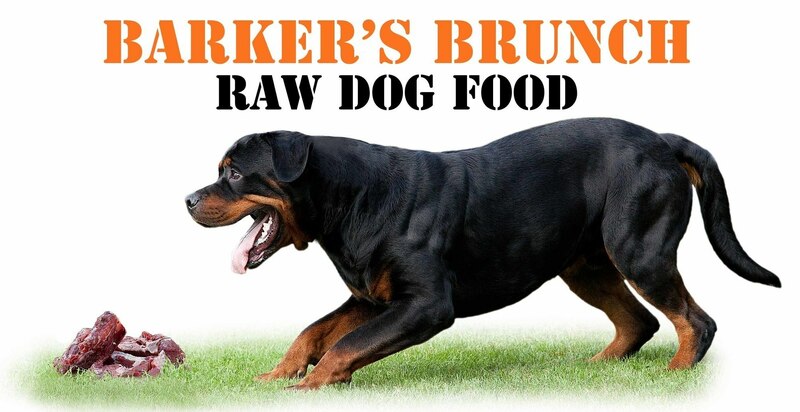 Barker's Brunch is simply here to provide a reliable supply of RAW dog food diet ! NEVER cook bones ! Bones become brittle and splinter when cooked. This can injure or possibly prove fatal for your dog ! NO COOKED BONES ! EVER !